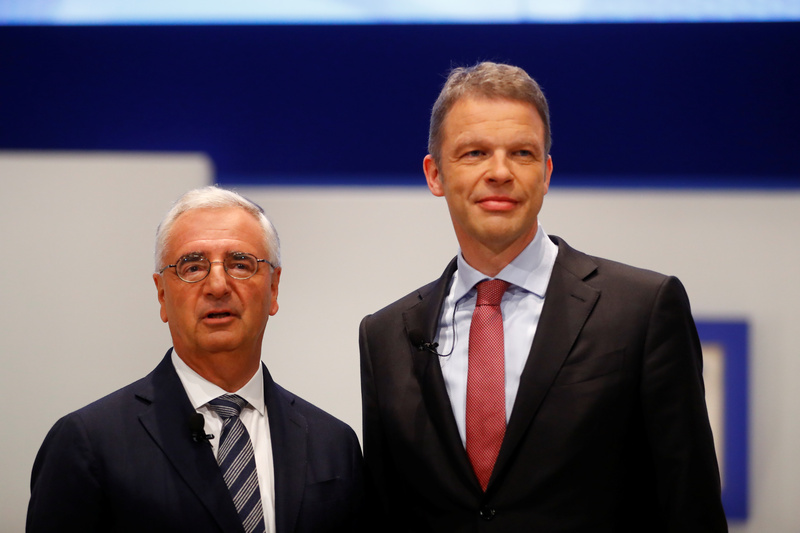 Deutsche Bank's Supervisory Board Chairman Paul Achleitner and Christian Sewing, new CEO of Germany's Deutsche Bank, pose during the bank's annual meeting in Frankfurt, Germany, May 24, 2018. Commerzbank is working with Goldman Sachs, Rothschild and Hengeler Mueller on a possible merger with Deutsche Bank, according to a Reuters article on March 18 citing sources. Citi is advising Deutsche Bank, which is also using its own in-bank team of M&A advisers, according to a person familiar with discussions. In Germany, Chancellor Angela Merkel's chief of staff said the government was scrutinising the merger after a union warned a tie-up could lead to 30,000 job losses. The concerns underline the obstacles to combining the banks, which confirmed talks about a tie-up on March 17 following months of pressure from Berlin. The government has pushed for a deal amid concerns about the health of Deutsche Bank. Deutsche Bank shares were up 4.6 percent to 8.16 euros while those in Commerzbank were up by 6.5 percent to 7.61 euros on March 18.